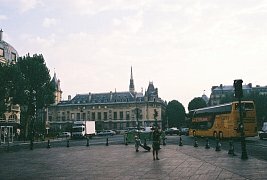 Paris France - walking to the Louve museum. 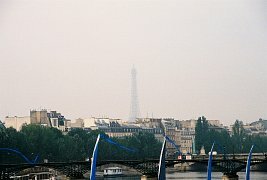 The second half of our vacation was a stay in Paris. Margaret and I took an 8 hour train trip from Munich to Paris. The train was pretty hot by American standards - but then there was a record heat wave going on across Europe. We discovered the car behind the engine stayed the coolest so we sat there. 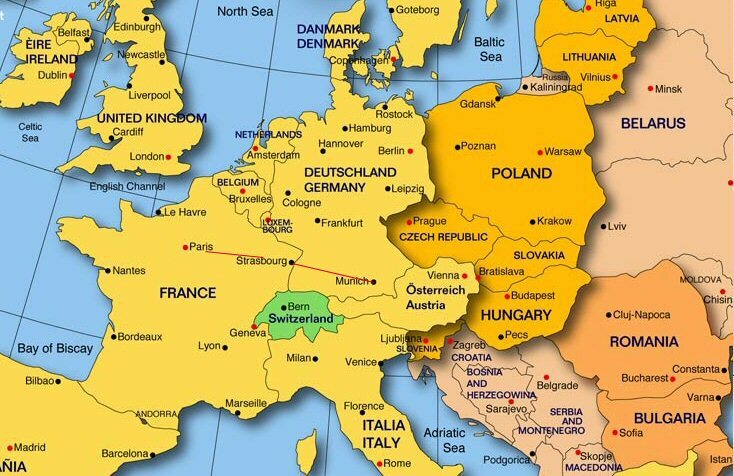 The train went 'forwards' until Strasbourg and then 'backwards' to Paris. I read the train schedule wrong and we arrived at the station 20 minutes after the train was supposed to depart. Cousin Frieda cooly suggested that the train might be late. We ran up to the platform and a' voila - there it was! We had no time to say proper good byes - we had the greatest time staying with Frieda and Bernhart and daughter Lena. They made us feel welcome and they showed us how wonderful Germany is. 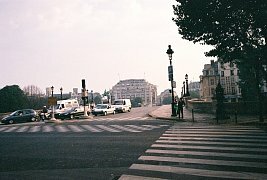 We arrived in Paris in the late afternoon and took a taxi from Le Gare du Nord train station to our hotel in the left bank. That night we walked to Notre Dame and for once I left my camera behind. Now it is the next morning and this first Paris picture shows us now in Paris, in the Left Bank, walking from our hotel to the Louve Museum. 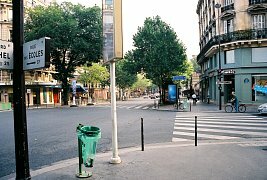 Our trip coincided with record heat in Paris - it actually reached 104 F. Nearly 15,000 people across France ended up dying in the heat wave article 1 article 2. 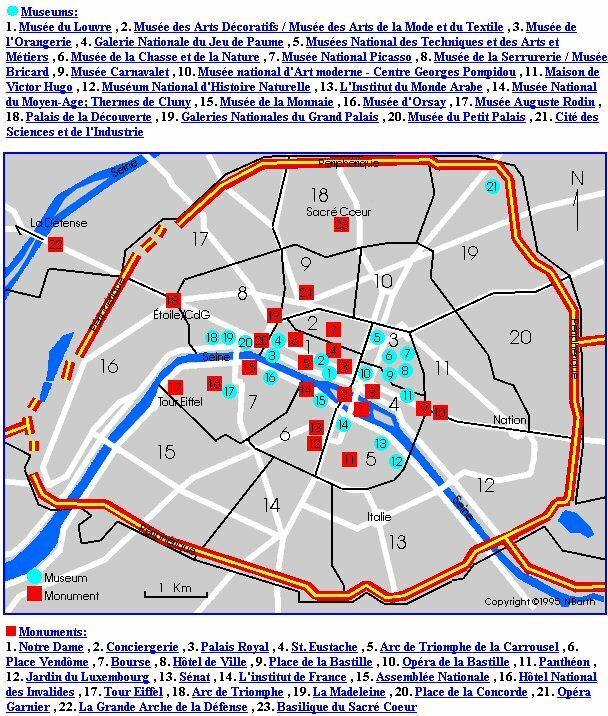 Paris is divided into 20 administrative districts called arrondissements, and split in two by the Seine River. 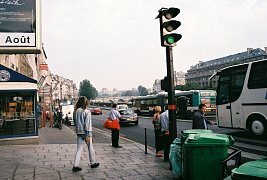 North of the Seine is called the Right Bank (or Rive Droit) and the south is called the Left Bank (Rive Gauche), which only makes sense if you are facing west. Here is Margaret at St. Michael. St. Michael is a large statue with a waterfall that sits on an intersection by Pont Neuf. The spire in the background is from St. Chappelle. 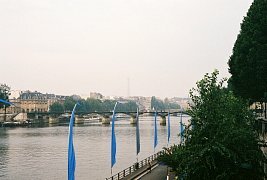 This view shows a view down the Seine shows Pont Neuf bridge. 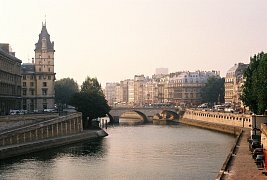 Across the Seine is the Samartine department store. You can go up to the top floor and grab a snack at the restaurant and admire the view. Just so you know, it's pretty expensive. And you are forced to order something. Our first view of the Eiffel tower. The blue flags are from the beach of Paris. 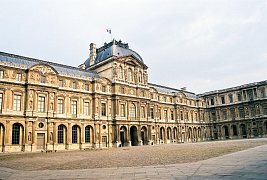 Here is the Louvre. We are going to walk through the entrance in the center of the building. We are in one of the inner courtyards now. I thought the French flag added something. 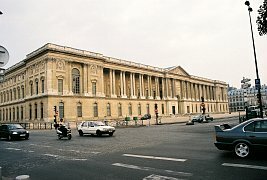 Here is the entrance to the Louvre. 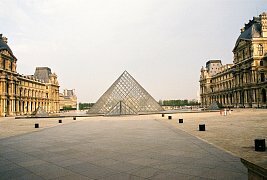 This pyramid that gives access to the underground foyer of the Louvre was constructed under direction of President Mitterand. It contains exactly 666 panes of glass. 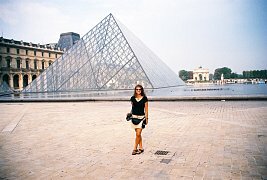 We are going to walk around to the back of this glass pyramid and then go inside it to reach an entrance to the Louvre. Here is my number one travel companion.